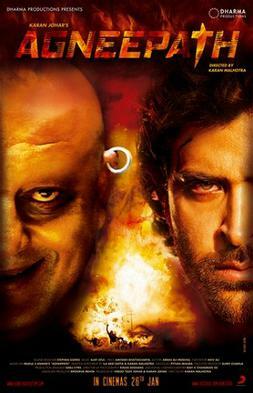 Hrithik Roshan starrer Agneepath was an unintentional funny film for me. No, I am not really a big fan of the original (1990; directed by Mukul Anand) starring Amitabh Bachchan but if we are talking remakes then the earlier version still wins. Karan Malhotra’s new Agneepath is full of plot holes and has the 80s-90s film-making sensibility that makes you cringe. I am a big fan of the original masala style of Bollywood film-making but the new Agneepath seems more outdated than the original one. Of course, the new film is also set in the 90s (1992 to be precise) but in a thriller made in 2012, one expects the filmmaker to respect the intellect of the audience. Let me list down a few gaffes to illustrate my point (spoilers ahead). Inspector Gaitonde (Om Puri) makes a presentation on the gang wars in Mumbai and in the slide show, presents a photograph of an emerging young gangster, Vijay Deenanath Chauhan (played by Hrithik Roshan). Unfortunately, the picture is not the latest one but of a 12-year-old Vijay (Arish Bhiwandiwala) as they haven’t been able to get a recent photo of him (he is now shown to be 27-years old). Gaitonde goes on to describe everything about the gangster, down to his address and the charitable trust he runs. 10-minutes later, Vijay pays what-seems-like a regular visit to the inspector at the police station. But, they haven’t been able to get a picture! Inspector Gaitonde in his detailed slide show also talks about Mandwa, which apparently is run by Kaancha Cheena like Hitler’s concentration camp. Really! And the Government of India sits pretty? As per him, they do not raid Mandwa as last time they tried, it led to many civilians dying in cross fire and human rights commission created a ruckus. So, now they decide to let Mandwa be. In the second half, Vijay’s mother, Suhasini Chauhan (Zarina Wahab) while watching TV recognises a gangster murdered by Vijay as Surya from Mandwa. Please note when she left Mandwa, 15-years-ago, Surya was a kid and did not look anything like his grown up version. Neither did Suhasini stay in touch with folks in Mandwa who’d send her photographs (also Facebook wasn’t there in 1992). Heck, she didn’t even stay in touch with her own son! After recognising Surya on TV, Suhasini for some reason goes to the police station to explain Vijay’s revenge plan to Inspector Gaitonde. Why? I don’t know. Why does she explain it to the first police man she sees (who is on pay rolls of Kaancha) I don’t know! Hrithik has abs made of steel! In a fight with Kaancha, Vijay gets stabbed by at least a 12-inch long and 2-inch wide knife but after his shirt is torn (yes ladies, the abs are on display) you only see a hint of blood and lots of black soot. Let’s leave all this aside and agree that the director wanted to make a 90s style film and didn’t care much about logic. After all Bollywood is about taking a leap of faith! Even then the film doesn’t shine much as both the build up and the climax are long and tedious (screenplay: Karan Malhotra, Ila Dutta Bedi; editing: Akiv Ali). Cinematography by Kiran Deohans is excellent but the production design lets it down. Sabu Cyril’s sets are so unbelievable that you forgive Omung Kumar’s over the top designs for Bhansali films. The fake banyan tree and Kaancha Cheena’s den look silly and well… fake! Music by Ajay-Atul is just about ok and the songs hinder the narrative (lyrics by Amitabh Bhattacharya). The much talked about item song, Chikni Chameli (featuring Katrina Kaif) does what it was meant to – help in film marketing and support a dragging second half. Being an action film, you’d expect some memorable stunts or fight sequences but you get none; there is just a lot of blood and gore (action: Abbas Ali Moghul). Coming to the acting department; I think Karan Johar did well by choosing Hrithik Roshan over Abhishek Bachchan, son of the original Vijay Deenanath Chauhan. Hrithik does a good job and is believable in a local, gritty character that is cunning and opportunistic. Priyanka Chopra as Kaali is forgettable; she had a small role in Kaminey also and we remember Sweety but here you don’t connect with her, you don’t care for her. Sanjay Dutt as Kaancha Cheena is menacing and looks-wise reminds you of Marlon Brando in Apocalypse Now and Ralph Fiennes as Voldemort in Harry Potter. The real star of the film however is Rishi Kapoor who plays Rauf Lala, a ruthless drug lord in Mumbai. His is a new character that did not exist in the original film but leaves an impact. Watch Agneepath if you’re a Hrithik fan and also for Rishi Kapoor.